All bird feathers evolved from scales. In fact, birds still possess scales in the lower parts of their legs and feet. Feathers are the most complex structure found in present day vertebrates. They aid in flight, thermal insulation, waterproofing, and coloration. 1. Vaned feathers which cover the exterior of the body. 2. Down feathers which are underneath the vaned feathers. Vaned feathers cover the whole body and give the bird its shape and color. They include both the flight feathers, and the tail feathers. Down Feathers are smaller but lack the barbules and their accompanying hook-lets so they are not zipped together and do not look so neat. In fact they are soft and fluffy. They provide most of the insulation and are so good at this, that humans for years have collected the “down” from various birds to put into sleeping bags, pillows and quilts. Brood patches are areas where the feathers fall out during or immediately prior to incubation of the eggs. 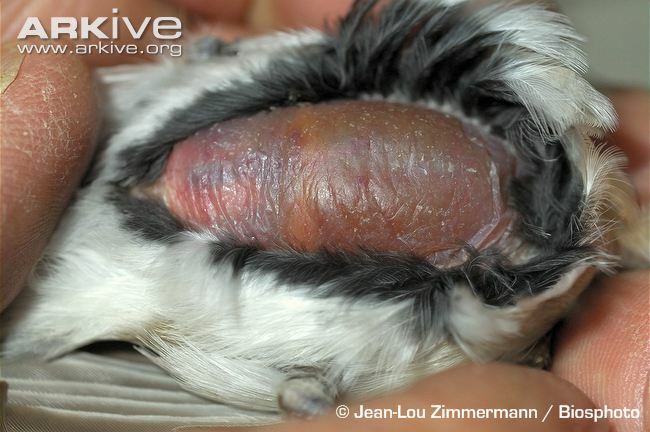 These areas of bare skin on the bird’s abdomen are heavily infused with blood vessels and allow the incubating adult bird to transfer heat to the eggs, thus speeding up development of the embryo. Although feathers are light, an osprey’s plumage weighs more than its skeleton. 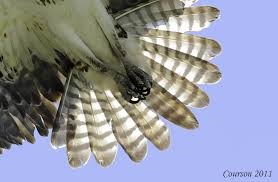 The bones of an osprey are hollow and contain air sacs. Color patterns serve as camouflage against predators looking for a meal, not to mention courtship displays. Ozzie remembers the Magenta streak in Angela’s brow. It was breathtaking. If Ozzie and Harriett hatch fledglings this year, you will be amazed with their coloration and camouflage. In earlier post we discussed the evolution of birds. Birds branched off from reptilian dinosaurs in the late Cretaceous period, 100 to 200 million years before present. It is the presence of feathers that is unique to birds. Other animals can fly, other vertebrate animals have beaks or bills, other vertebrate animals lay eggs, but no other living animal has feathers. Every bird has feathers and everything that has feathers is a bird. Feathers have a basic form of a central hollow supporting shaft called a ‘rachis‘ and a number of fine side branches. These side branches have even finer sub-branches in contour feathers. The side branches are called barbs and are linked together by a set of barbules and their hook-lets. Barbs have side branches of their own called barbules. The upper ones containing a series of hook-lets and the lower ones without hooks but slightly convex in form to catch the hook-lets of the barbules from the next barb along the shaft. This is perhaps best understood by examining this diagram. The base of the feather – where there are no side branches – is called the quill and at the base of this is the hollow entrance that was used by blood veins to carry nutrients to the growing feather when it was alive. The gripping effect of any one set of barbule hook-lets is not great, but like the threads that hold your clothes together the combined effect is sufficient to keep the feathers together. The overall presence of all these barbs and barbules together is called the vane of the wing. The rachis and the vane are the two parts of the feather you see with the naked eye. Take a moment to examine the structure. Amazing? Yes. Now remember the osprey has voluntary and involuntary control of each and every muscle group that contain these feathers. The next post will require a one year leap in time. The entire year of 2013 must be left to future storytelling, since the homeward migration has begun in South America. I will certainly try to fill you in this summer if the action gets slow. Pretty slick way to add Ozzie, Harriet and Angela into the facts about the feathers. Was this a test to see if we are paying attention? Did I pass? You passed with an A+. Thank you for your comment, I very much appreciate it. Love, Harriet.